The ‘Seol’ of The Moon that Embraces the Sun, Yoon Seung Ah (28), who is melting whenever approaching fire, is putting down ‘Heo Yeom,’ and had a pleasant dating with lover Kim Mu Yeol (29). She no longer a sad unrequited loving girl. 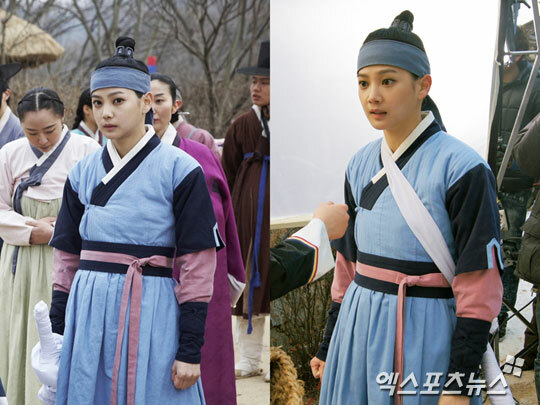 In The Moon that Embraces the Sun, Seol who is played by Yoon Seung Ah was stabbed 3 times in order to save Heo Yeom, and in the end died in the embrace of Heo Yeom. When she was dying, she said, “I am now much happier than any woman in the world.” The sentence made a lot of viewers shedding tears. Yoon Seung Ah revealed her romance with Kim Mu Yeol in February this year. Recently they were captured in photos to be enjoying dating at Cheongdam-dong. Although both of them was wearing a hat, and Yoon Seung Ah was even covering herself with scarf exposing only the eyes, but her boyfriend Kim Mu Yeol did not cover up at all. On the day, both of them dressed primarily in black tone, holding shopping bags, seems to done a lot of shopping. After shopping Yoon Seung Ah seems very happy, walked down the steps bouncily. And boyfriend Kim Mu Yeol had been leading in front all the way, opened the door for Yoon Seung Ah, flagged the cab, and opened the car door for girlfriend, as if a knight who protects the princess.